Apple has come up with mind blowing updates of macOS 10.13.4 beta after the release of watchOS 4.2.2 developer beta 5. Simultaneously with the iOS 11.3 beta release, the beta version of the Apple watchOS 4.3 developers is also in the market. So much is expected of this Apple watchOS 4.3 considering the new features announced which included; A Siri watch face which gathers info from many sources in order to show the user relevant contents all through the day, music app, bug fixes from the previous released version, nightstand and charging animations. A major question runs through our mind as we check out the announced features of this watch: will watchOS 4.3 AirPower come with wireless charging support? In the second picture presented, the bright green image of the symbol illuminating the intelligent clock and standing next to the clock pushed us into this thought. AirPower support for charging seems to be coming to Apple Watch. In the near future Apple’s In AirPower wireless charging pads or mats will be compatible with your iPhone and AirPods Apple Watch. AirPower supports multiple devices using a new charging standard. 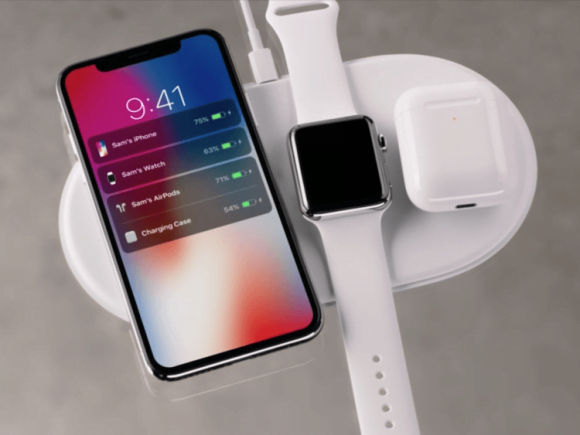 Apple AirPower wireless charging was launched in September 2017. It will be available for purchase in 2018. This device, which only recharges devices made by Apple wirelessly, has received much attention. It has been described as a major revolution in technology. Nothing like it has ever been seen. What other thing is new in WatchOS 4.3? The famous music controls for iPhone are back. Wow! This is a good news for Apple Watch users. At a point, it seemed as though iPhone lost its capacity to manage songs that are running on an Apple watch. But apparently this feature has returned because of high demand from users. It is now easy to control any song playing on your iPhone through the Apple Watch right on your wrist. You could select any song on your iPhone from the Watch and connect it to an Airplay Speakers to enable you enjoy your music from any part of your home. In addition to the sleek thing about WatchOS 4.3, nightstand mode is supported in a portrait orientation as shown in the second picture above, unlike its previous versions which has the same mode in landscape. This upgrade in WatchOS 4.3 is widely preferred to the previous version WatchOS 4.0.